The American Lawn Mower is a Reel Lawn Mower. 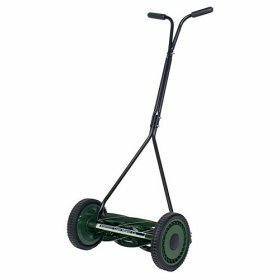 If you are the type who enjoys a little work out in the yard, this is the mower for you! A Reel type mower uses blades on a revolving cylinder which rotate into contact with the bed knife, resulting in cutting grass to the height of the blade. I am a firm believer in reel lawn mowers. They do an excellent job of cutting grass, have few moving parts and are healthier for the environment. As a child, my first experience in mowing was with a reel mower. Even today I re-live my childhood memories while working out in the yard. The smell of freshly cut grass is intoxicating. Remember how sweat tasted as a child? The salty flavor just begs for a glass of ice cold lemonade. A reel mower has fewer moving parts. This makes mower maintenance much easier. If you can sharpen a blade, you have done all the maintenance that this type of mower requires. The environment thanks you for not using electricity or gas. Many golf courses have switched over to reel style lawn mowers. They mow well and produce finer clippings. Reel mowers will not leave oil or gasoline residues that may affect a golfer's score. At today's gasoline prices, why waste your precious resources when a reel mower works even better than your gas powered one and keeps a clean and healthy lawn. Your grass will thank you!